( December 31, 2014, Colombo, Sri Lanka Guardian) We were all ‘happy’ when the long term civil war which nearly destroyed the country, came to end in 2009. We all applauded despite the fact that it left thousands of civilians dead that even today, cry out for justice. Despite the general jubilation at the end of the war there was one man who was not quite so happy. The war was a cause for fear that he was happy to use to justify extra-judicial methods of law enforcement. And with the cessation of hostilities he had to find another source of ‘fear’ to justify his means. Of course, he never actually stated this in public but was happy to ‘suggest’ the possibility of renewed violence to grab votes. This man is now suffering internally and no one would be surprised at any ploy he comes up with to demoralise the public and increase the fear of the unknown, which, he believes will gain him the votes needed to remain in power. 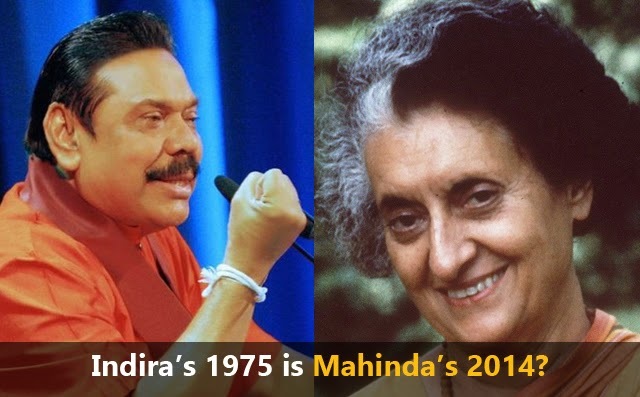 He is, of course, none other than the Mr. President Mahinda Rajapaksa, who is testing his fortunes in next month’s Presidential election in the country, eying a third term, by calling for an early election. However, what is emerging in the political situation in the country is that Rajapaksa is losing his moral and ethical power. Mr. Rajapaksa is rapidly turning into the most destructive and abusive villain of history. There is nothing he will not do to the people of his country in order to stay in power. Meanwhile, a great political alliance is addressing the real issues of the general public and turning the political discourse into a new debate. It is making inroads in the public conscience. Under these circumstances, defeat can be long-term relief to the President and his clan. It was one of most important meetings that the common candidate held yesterday morning in Mannar where he met Mannar Bishop Rt. Rev. Rayappu Joseph, a one of outspoken priests of the Church. Because of his views he was labeled as a national traitor who was fuelling separatism. Despite the importance of the meeting only a few inches were given by the local printed newspapers. Little attention was given to the conversation and the points he raised with the common candidate. However, one of local language newspapers, Divaina was able to grasp the basic points in brief. 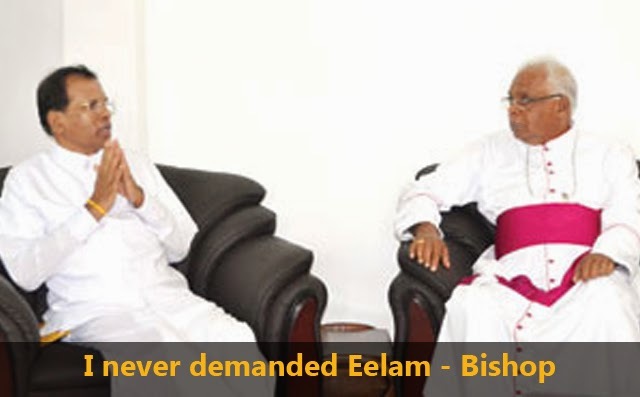 In the discussion, according to the report, the Bishop denounced the claimed which most of opponents brought against him as an advocator of Eelam. “I never demanded Eelam. What is the Tamil people are expecting is to live in peace and harmony with equal opportunities in the unitary state,” the bishop made an important statement before the common presidential candidate. In his response the common candidate Mr. Maithripala Sirisena said, “My expectation is to ensure the Sinhalese, Tamil, Muslims and all people live with dignity under the good governance of the unitary state in our motherland”. Those two quotations are not merely political remarks but the serious outcome of the healthy discussion between both represents parties. There is no doubt but this is something to brag about. In other words this is the beginning of the healthy discourse and a line of real reconciliation. This is what President Rajapaksa has been blind to and actively avoided understanding the ground reality. When a person loses contact with the ground reality, it is only natural he will delude himself by creating his own ‘realities’. What he has created, however, is his own personal nightmare. No one can deny that the Rajapaksa is having the devil dance of the end game of abusing power. He is on the road where the leaders like Marcos, Suhartho travelled. However, thanks to our former leaders who created the situation in which the President is above the law, therefore the incumbent may yet have loopholes to avoid defeat. He has already removed the backbones of the state institutions and he has further distorted the system to get rid of the real battle. Is he going to leave the office as a defeated leader or will he attempt another “humanitarian operation” to solve the “internal disturbance” like what the late Prime Minister Indira Gandhi did in 1975?